Cut potatoes into quarters. Place in boiling water & cook until fork tender. Drain & let cool, cut into one inch hunks. In a dutch oven or large pot melt butter. add celery, carrot, onion & garlic. Cook for 8 minutes or until carrots are slightly tender. Sprinkle in flour & cook for 2 minutes, stirring frequently. Gradually whisk in the chicken stock. Add the milk & whisk until incorporated. Add the beer & stir well. Gradually add in the cheddar & Parmesan cheese, whisk until melted in. Add the potatoes & simmer for 20 minutes. Remove soup from heat & using an immersion blender, blend until smooth. Add salt & pepper to taste (If you don't have an immersion blender just use a potato masher). 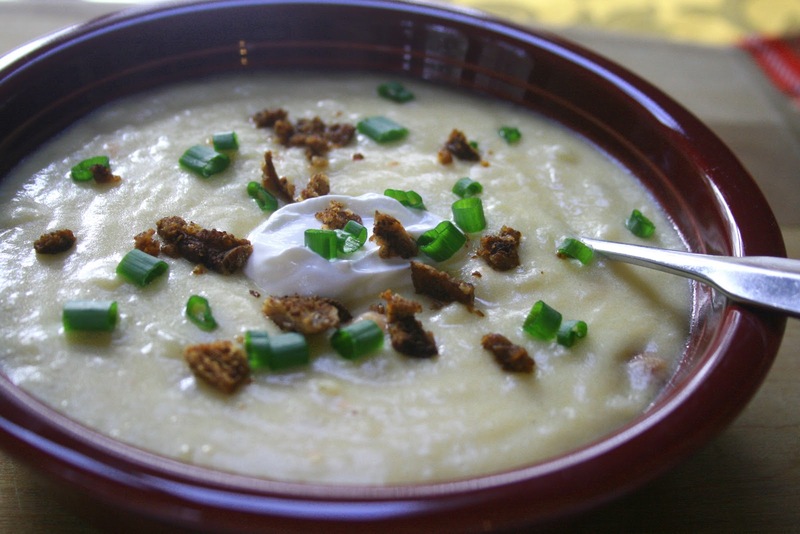 Serve warm topped with sour cream, bacon, & green onions. Enjoy!